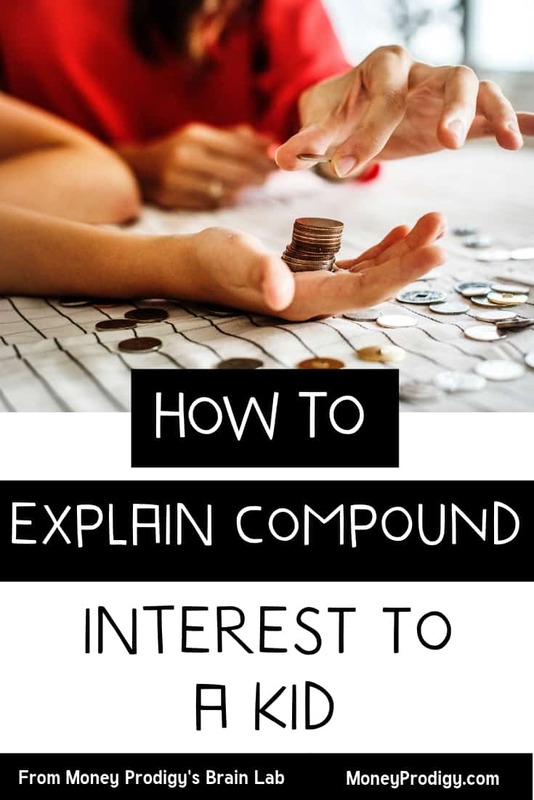 Fun compound interest activities and compound interest games to help with how to explain compound interest to a child as well as help make your kids WANT to save their money. Compound interest − a phenomenon that you want to get cozy with − can be a difficult thing for your child to get. Heck, it can be a difficult concept for us, Mama Bears! The good news is that as long as your money and your child's money is in a savings account, compound interest works, whether you understand it or not (how cool is that?). Still, we want your child to get into the über-awesome habit of saving gobs of money for the rest of their lives, so we need them to discover the coolness of money earning its own money. So, how to explain compound interest to a child? This is where things get a little…sticky. You see, this stuff doesn’t get really exciting until there’s a lot of money involved (“a lot” in kid-context = thousands of dollars). Yet, if your child doesn’t pick up this habit when they have $5 to manage, then getting to the point where they can save enough money to make compound interest exciting will be more difficult. You see what I mean? 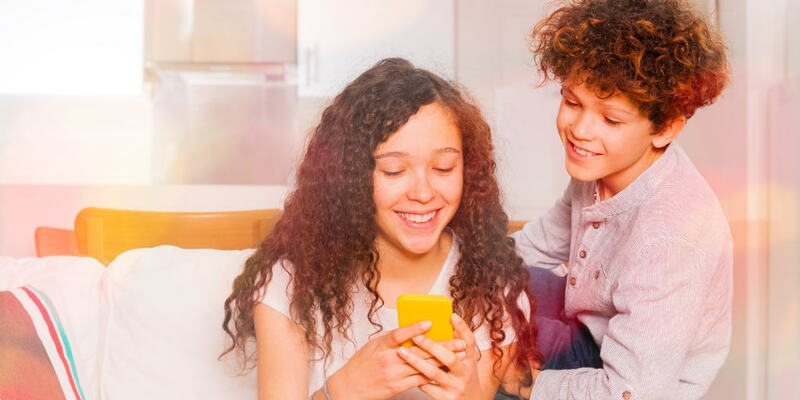 We want to instill good money habits in our kids now, while they’re young and the stakes are low, so that those same money habits they've established will help make their money soar when they get to the point where they're earning real paychecks. Yet, what kid is going to get excited about earning $0.01 and $0.015 due to compound interest? Before we tackle how to deal with this with some fun ways to teach compound interest, let's get down to the basics. First up, how do you explain compound interest to a child? Honestly, I didn’t even get introduced to the concept until probably my late teens. And I didn’t really grasp it until my early 20s. But before we dive into a compound interest definition for your kid, let’s back up a moment. Because you can’t really teach compound interest until you teach what interest is. If your child is just starting out with this whole money thing, they might not even grasp the idea that their money earns money AT ALL, let alone that that earned money can then earn even more of its own money. So, start simply, with simple interest. Once they understand that their money earns money, you can move onto compound interest. Money you put into a savings account earns interest (money). Since it’s YOUR money, you get to keep the interest, and it’s added into your savings account total. Because it becomes part of your total savings account, the money you put into your account PLUS the interest you earned then earns it’s own interest. If that's still too complicated, then just know that the whole gist of compounding in as basic words as possible is this: you earn interest on the money you keep in a bank, the interest is added back into your money. Then you earn interest on your new amount of money (which is bigger now, thanks to that earned interest!). Addition: Kids add money to their bank account (from babysitting, birthday money, allowance, chore commissions, etc.). Multiplication: Interest multiplies that money. And the more often you get to multiply something? The greater your overall earnings. Think of compounded monthly and compounded daily simply as how often the multiplication gets to happen. Compounded Monthly: This means the interest earned is added back into the original amount (reinvested) one time a month. So, once per month, your original amount grows. Compounded Daily: What does interest compounded daily mean? It means the interest is added back into the overall amount every day, so that EACH day, the pot of money that earns interest is growing. Interest is earned each day of the month, regardless of when compounding occurs. Monthly versus daily just refers to when that interest is added to the original pot of money (the one that's earning). Okay, okay. Words and kid-friendly definitions are great and all. But how do you get your kid to really GRASP this whole compound interest thing (you know, so that they're more likely to save money instead of spend it on everything at the checkout counter)? Here's the trick: let them discover their own money earning ITS own money. Mama Bear Cliff Notes: Teaching your child about Compound Interest giving you a headache? Skip the sit-down and have your child watch Camp Millionaire's video on Compound Interest instead (9:02 minutes). You may not have ever thought you’d see “fun” and “teach compound interest” in the same sentence. But don’t worry – I’ve got you covered! I’ve curated a list of fun ways to teach compound interest. Personally, I would prioritize having your child play a round of compound interest detective below (my own created activity to teach compound interest), because seeing compound interest at work in their OWN savings account on their OWN money is going to have the most impact on them. This money activity is going to make your child realize that THEIR money is earning it's own money, right now and all the time. Even when they eat, sleep, and go to the potty. Detective Step #1: Gather two consecutive statements representing two compounding periods from your child's savings account. So if the account is compounded monthly, gather two months' worth of statements. And if your child's account is compounded quarterly? You'll need two quarter statements. Annually (yikes, you're missing out on compound interest earnings over the long haul with this kind of setup)? Get two annual statements. While seeing their statement online is cool, printouts are even better. Print it out if you can find it online, or call the bank and ask them to send you one by mail/email. Detective Step #2: Have your child dig into the two statements for a few nuggets of information. They want to find and then highlight both the starting balance + the ending balance (after interest was added) on each statement. At the bottom of each statement, if it's not a line item somewhere, have them write down how much interest was earned (by subtracting the ending balance from the starting balance). For example, let's say they have $250 in their account at the beginning of the first statement's month, compounding monthly, at 0.75% APY. It would have earned $1.56 in that first month, bringing the ending balance to $251.56. Then in the next month, the interest is calculated on $251.56 − not just the $250 − so it will have earned $1.57 instead of $1.56. Which then, of course, gets added onto the principal to become $253.13 for the following month. Detective Step #3: Ask your child why their money earned less during the first month's statement and why it earned more during the second month's statement (so in the example above, why did it earn $1.56 in month 1, but $1.57 in month 2?). They likely won't know the answer. Cue your “compound interest” discussion (use the kid-friendly talking points from above). Detective Step #4: Have your child do some further detective work and find out how often their account's interest is compounded. If you can't find the information in the teensy-weensy font at the bottom of your bank's page, then just make a phone call and ask someone. Bonus points that you show your child how to be proactive with finances by getting an answer! Detective Step #5: Have your child input their savings information into this compound interest calculator to figure out which is a more advantageous way to earn money: compounded daily, monthly, quarterly, or annually? Open up this compound interest calculator. Fill in the current amount you have in savings for the “initial investment” amount. Then $0 for the “Contribute” amount, and then fill in the number of years left that they have until they take over the account (typically at age 18 or 21, depending on the state you live in) in Step #2. For Step #3, fill in their current savings account APY, but leave the “Range of interest rates” field blank. Finally, have them pick “Annually” for Step #4. Click “Calculate”. Record the amount that your money will have earned. Repeat the above steps three more times, only replacing Step #4 each time to “semi-annually”, “monthly”, and “daily”, then clicking “Calculate”. Detective Step #6: Ask your child which is the best way to have money compounded (and by “best” I mean have them choose the compounding method that will earn their money the most amount of money). Mama Bear Note: you really want to play up the fact that this is without your child adding one. extra. cent. to this account. The savings just grows on its own! Optional Detective Step #7: If your child is not entirely impressed with their approximate $19.40-$19.47 interest earnings (or whatever theirs comes out to be), have them fill in whatever amount they would like as the initial investment amount…sky is the limit. And of course the greater (or in this case, “larger”) their imagination, the more compound interest will come through. One of the problems with getting kids to care about saving their money and feeling the effects of compound interest is, well, getting them to associate themselves with their adult versions. Money takes TIME to compound, especially small amounts of it. They might not truly get the benefits of compounding until they’re as old as you and I (though, fortunately, the earlier they start the sooner it’ll make an impact on their lives). So, I’ve come up with a really fun activity called the Compound Interest Ager. 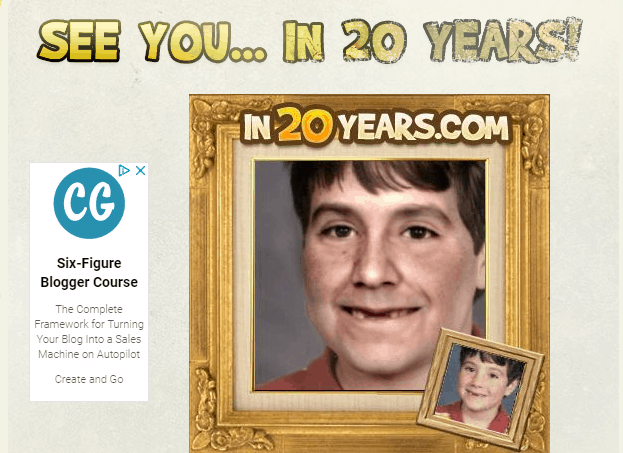 You’re going to have your child see an older version of themselves, and then do a compound interest calculation that will show them how much they'll have at that age. Psst: if nothing else? They’ll probably get a good laugh out of this one. Or they’ll scrunch their nose up in disgust at the small wrinkles and 5-o-clock-shadow on their photo. But either way, you’ve caught their attention! You can purchase an app to age your kid’s photos, but I found a free one that’ll get the job done here. You can either age their photo by 20 years, or by 30 years. You choose male/female, and click “no” for drug addict (yikes!). Here’s one I did of my husband, from a photo when he was just 6 years old. I aged him by 20 years, and he looks just like his brother (though, his brother has front teeth, of course). Next, you want to show your child how much money their savings account grows to either 20 or 30 years from now, based on their savings behavior (and the magic of compounding interest). Length of Time in Years You'll Contribute: Put in either the 20 or 30 years you chose in the aging image app. Compounded: Let your child play with the four choices — annually, semi-annually, monthly, and daily. When you're finished, you want to click on the button “show table”. There, you'll be able to see your kid's total contributions, and how much their money earned over the years for them. So, at $10/month contribution, your child will have contributed $2,500 over 20 years. BUT, their money will have earned an additional $774.53 through compound interest, meaning they'll have a total of $3,274.53 20 years from now. The main questions you want your child to answer are: How much money will they have when they’re insert future age? Now, how much money will they have WITHOUT compound interest at that same age? This should show them the “magic” of compound interest, plus motivate them to make it work in their favor. If you have a group of kids, you can watch this compound interest group activity. I like how it introduces something physical with money education — the kids get to stand up and represent different parts of the money equation. Again, I want to emphasize the fact that I wasn’t introduced to compound interest until my teens, and didn’t understand it until my early 20s. And I’m on track to retire a millionaire! If you do some of these fun activities to teach compound interest with your own kiddos? Well, they’ll be way ahead of the pack. Heck, they might even retire a billionaire one day, depending on how early they start.